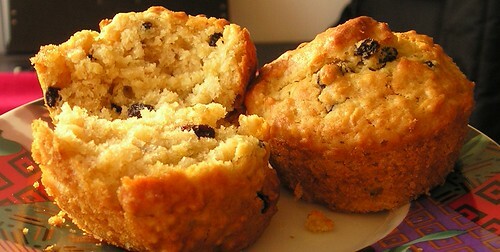 Ruby’s Oatmeal Buttermilk Muffins - Do You Know The Muffin Man? Recipe from a newspaper clipping my mom collected a long time ago. Notes: Differences from the recipe in the link compared with my copy: 1 tsp baking powder, no vanilla, optional addition of 1 cup chopped dates to the batter. Very easy to make. I usually double this recipe, just add 15 minutes or so to the baking time. These are very crumbly, with a slightly tangy taste.